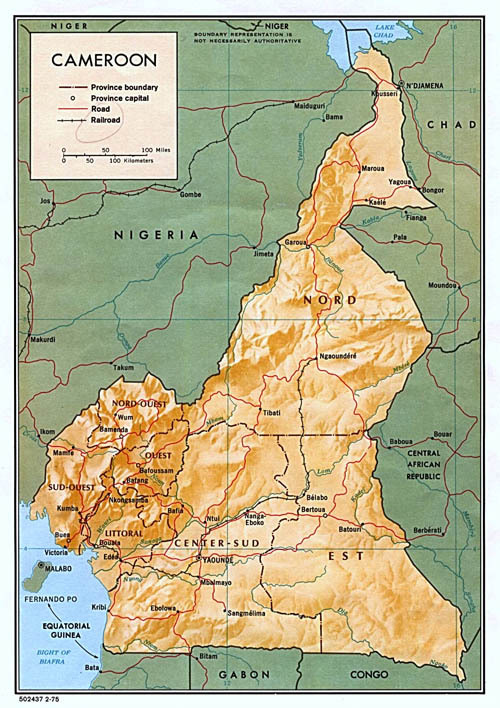 The Republic of Cameroon is a small country located in the "armpit" of Africa. Shaped triangularly, it is slightly larger than the Golden State of California. There is constant squabble between the French and English territory as to the exact location of the country - West or Central Africa. Paul Biya is the country's second octogenarian dictator. He came to power in 1982 through a political intrigue following Ahidjo's sudden resignation. His is currently serving his 5th seven-year term and is the longest-serving Africa's strongman. Biya's benignly healthy first wife died suddenly under mysterious circumstances in the 1990s while he was attending an Islamic conference in Dakar, Senegal. His second socialite wife, Chantal is of Lebanese decent and half his age. Biya is hardly seen in public at home but is often spotted in European capitals with money bulging out of his pockets. During the week of November 15, 2012, Biya celebrated 30 years of what many coined "thirty years of legalized corruption." The Yaoundé economy is usually grounded when he is leaving or returning from abroad. The main street that stretches from the airport to the Presidential palace through the busy downtown business district and major intersections are closed for hours. Cameroon and the United States maintain full diplomatic relations, though Cameroon does not remind most Americans of any place on earth. There are approximately 8,000 Cameroonians living in the United States, and several Americans living in Cameroon. The American Embassy and Cultural Center are located in Yaounde, the nation's capital. I watched the taped ABC News with the late Peter Jennings in the Center from 1984-87. The highest mountain in West Africa, at 4,000 feet, is Mount Cameroon, located in the South West Provincial Capital of Buea. This makes the area extremely cold. The mountain erupted in 1999, killing and displacing thousands of people. 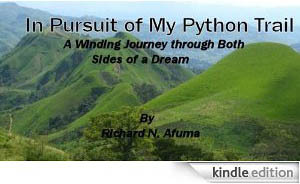 I lived in Buea with my stepfather when I was younger. Cameroon is a strikingly multilingual and heterogeneous country, with approximately 250 indigenous languages and ethnic groups. Each ethnic group or tribe is identified by a unique and common culture, language and history. Kom is one of the many ethnic groups or kingdoms. I hail from the Kom kingdom. Cameroon first made international headlines in 1974 when a previously-stolen 145 year old wooden statue, the Afo-A-Kom, belonging to the people of the Kingdom of Kom in the North West Province was found in New York City and repatriated to its people. I have only a few memories of this historic event. The Afo-A-Kom is an important symbol of Kom society and represents peace, unity and tranquility. Also, in 1986 a discharge of poisonous gases from Lake Nyos killed approximately 3,000 people and cattle. Lake Nyos is located close to my tribe and I know people whose relatives or friends were affected by the disaster. The late reporter Pierre Salinger of ABC News reported on the disaster from my hometown of Bamenda. The event was considered a national emergency. English and French are Cameroon's two official languages. There is, however, a deep digital divide between the majority Francophone population (80%) and the minority Anglophone population (20%). The University of Yaounde is the only fully-fledged institution of higher learning in Cameroon, although regional campuses have been opened in recent years. Admission for Anglophone students is extremely difficult. English also constitutes a major barrier for English-speaking students in the University, because bilingual education is not strictly enforced. It is highly disorganized and grossly inefficient. I attended the University (Department of Laws and Economic Sciences) from 1984-87. The Chancellor and professors are all political appointees of the president. A college in Cameroon is the equivalent of an American high school. Cameroon is a de facto multi-party political system. It is divided into ten provinces headed by a Governor in each province. The President appoints the Governors, who serve at his pleasure. The provinces do not have autonomous powers. The Northwest and Southwest provinces are the minority English-speaking provinces. Paul Biya addressed the country in English for the first time during his 1985 "New Deal" Congress in Bamenda, the first Chief Executive in Cameroon's history to do so. The government of Paul Biya is a corrupt ethnic oligarchy with power heavily concentrated in the hands of his Bethi ethnic group. He is one of the worst dictators in Sub-Shaharn Africa and the world. He rules by decree and appoints all public and private-sector employee, including office clerks who serve at his mercy. He does not know and and has not met most of his sixty cabinet ministers. The country is essentially ruled by a circle of trusted cabinet friends. He is hardly seen in public at home, but often spotted in European capitals. In short, Cameroon is ruled by a kleptocracy, or thieves. The country was voted twice by a German newspaper as the most corrupt nation in the world. Note: please visit Cameroon's entry in Wikipedia for additional information on the country.